The recommended dose of Siglita™ is 100 mg once daily. Siglita™ can be taken with or without food. For patients with mild renal insufficiency (creatinine clearance [CrCl] 50 mL/min) no dosage adjustment for Siglita™ is required. For patients with moderate renal insufficiency (CrCl 30 to <50 mL/min), the dose of Siglita™ is 50 mg once daily. For patients with severe renal insufficiency (CrCl <30 mL/min) or with end-stage renal disease (ESRD) requiring hemodialysis or peritoneal dialysis, the dose of Siglita™ is 25 mg once daily. Siglita™ may be administered without regard to the timing of hemodialysis. 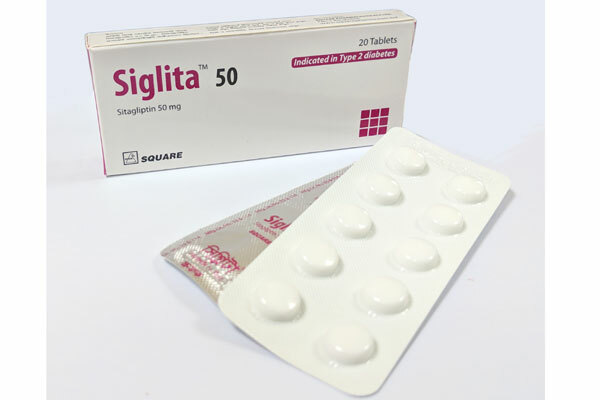 Siglita™ Tablet: Box containing 20 tablets in blister pack.